Friday night: Clouds increase. Lows ranging from the upper 30s to around 40. Saturday: Rainy. Cloudy. Breezy at the coast. Highs in the mid 40s. Sunday: Sunny. Nice. Highs in the mid 40s. Rain may put a damper on some of your plans this weekend before turning windy and drying off. Scattered rain moves into the forecast by Saturday morning. Between 6 a.m. and 9 a.m., the showers reach the south coast and spread northward toward Boston. Temperatures in the Worcester hills through southern New Hampshire will be near freezing, so freezing rain is a concern. Isolated slick spots are possible, but temps increase to above freezing during the afternoon. There will be a few dry hours in the afternoon for almost everyone, but staying cloudy. Another wave of heavier rain moves through the evening. Total rainfall looks to be about 0.25 inches to 0.5 inches north of the Massachusetts Turnpike and 0.5 inches to 1 inch south. Sunday: Turning windy, and drier. Highs in the 40s. Monday: Some of the season's coldest temperatures could be on Monday morning with a Canadian high spilling in colder air. Highs Monday will be around 30 degrees with sunshine. The Snowcap: Will the Next Storm Bring Some Snow? Meteorologist Michael Page takes us through the coming storms and what exactly an "Alberta Clipper" is. 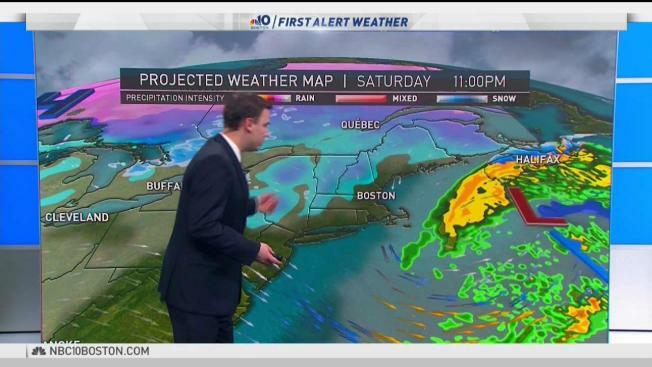 Tuesday - First Alert: A significant winter system will move into the northeast, bringing snow and rain. The freezing line placement is uncertain based on the different tracks in different forecast models. We are more confident in heavy snow across northern New England and more of a snow changing to rain scenario across southern New England. Stay tuned to the First Alert Weather Team for further updates on this storm system. Colder air may stick around for a longer time period through the rest of the 10-day forecast. Another round of snow is possible as we near the following weekend.